Piping design is the detailed specification of the physical piping layout within a process plant or commercial building. In earlier days, this was sometimes called drafting, technical drawing, engineering drawing, and design. Today this task is commonly performed by designers that have learned to use automated computer-aided drawing or computer-aided design (CAD) software. In this article, we will list the best options for piping design CAD software available on the market in 2019. Which software is best for piping design? CorelCAD 2018 is an affordable CAD solution for professional 2D drafting and 3D design. It offers a industry-standard file compatibility with .DWG, .STL, PDF and .CDR. CorelCAD 2018 has a new user interface that enhances time saving and offers a more intuitive way to design professional 2D or 3D drafts. The 2D drafting feature offers new helix tools for 2D spirals, advanced table tools, and a MultiLeader tool to configure and adjust callouts as your drawings evolve. The 3D capabilities offered in CoredCAD offers you a simple way to transform your 2D designs into 3D layouts with a wide array of intuitive tools – EntityGrips, Properties palette. ColedCAD is fully compatible with AutoCAD R2018 .DWG file format that ensures easy collaboration with your business partners. Quick InputPlay – brings commands directly to the cursor to easily input coordinate positions, lengths, angles, lines, etc. 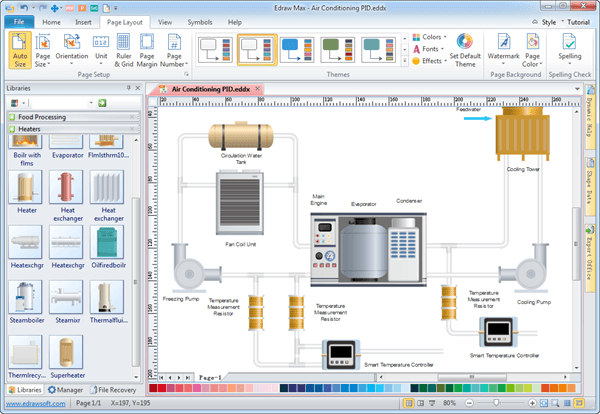 Edraw P&ID Designer is a professional tool that enables you to instantly generate piping and instrumentation diagrams. It can help you create professional-looking p&id, plant p&id, chemical p&id, distribution p&id and also power P&ID. Even beginners can easily use Edraw P&ID designer because of it’s predefined shapes and easy drag-and-drop creation process. All the shapes included in this powerful program are vectors allowing you to design high-resolution plans. Edraw also bolsters a set of powerful and very useful tool called ‘auto-connection’ that helps you connect pipe shapes quickly. Some of the shapes used in the process of creation have text boxes attached so labeling is convenient. The wide array of standard and smart shapes can also be used in many kinds of engineering diagrams. Shapes are constructed with a floating action button for flexible modifications and one shape has many varieties that used can change easily either by changing the theme or changing the font color and lines. 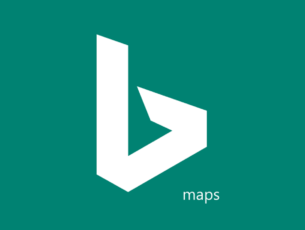 It is 100% integrated with MS programs and supports 18 formats of export. It was designed to work together with your colleagues, easily share designs with stakeholders and run design presentations. The images created can be either simplified with black and white symbols or colorful photo realistic images. One other great feature is the fact that the images are fully editable – you can change color, resize, separate. You can find a full ‘How-to’ guide on the tool’s official page. Cadmatic 3D Plant Design is a powerful darabase-drive tool that gives you tools for creating 3D layouts, piping, HVAC, cable tray and structural designs of plants in shaded and colored views. It also produces information for installation and ordering materials. The piping design feature includes unique tools for piping designers to easily create complex piping designs. The design process is fully integrated with diagrams and pipe routing that ensures your design is intuitive and easy to understand. 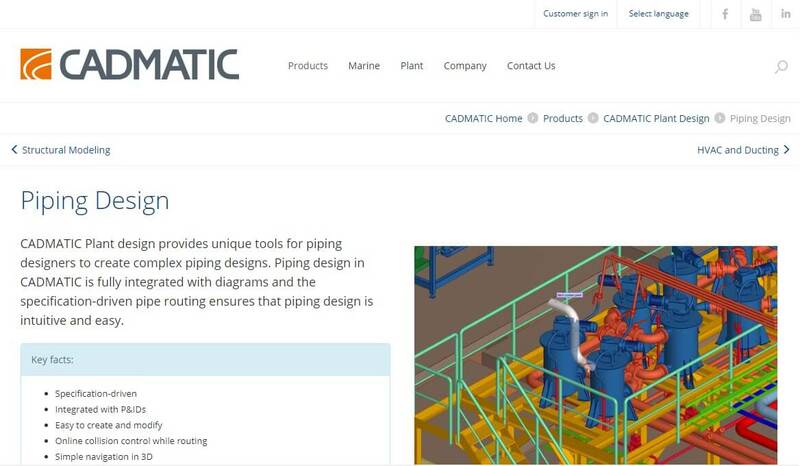 Cadmatic Plant Design assures you that the correct components from the standards library are being used when creating a piping design. This program takes advantage of the suggested connection points according to the diagram and online collision control, allowing you to create piping designs without errors. 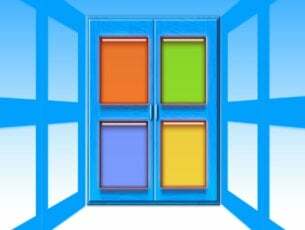 With each software update extensive standards are provided (DIN, ANSI, ASME, EN and others). The powerful piping design modification tools give you the possibility to change the pipe routing geometry, the nominal sizes of pipes and separate components, checking pipe connection compatibility automatically. Cadmatic Plant Design 3D viewing technique and model database structure keeps your designs extremely light and user friendly even in the most complicated plant models. The pipe and cable tray routing is constructed so it is driven by your specifications, ensuring that the correct materials, sizes and components are being used. Component Manager – allows you to model different kinds of components such as pumps, tanks, etc. 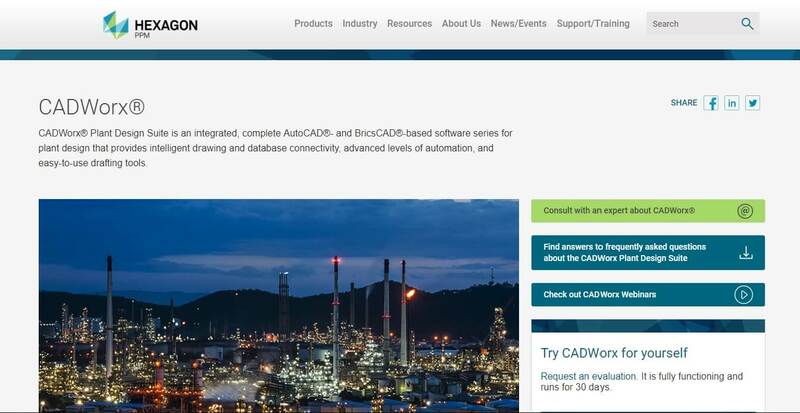 CADWorx is an integrated complete AutoCAD and BricsCAD based software that provides intelligent drawing and database connectivity, professional level of automation and easy-to-use drafting tools. This software is quick and easy to set up and use. The bi-directional links between CADWorx and analysis programs for pipes and vessles enables you to easily share information while keeping the entire information databse sunchronized. Supports different industries – chemical, offshore, piping, power, etc. 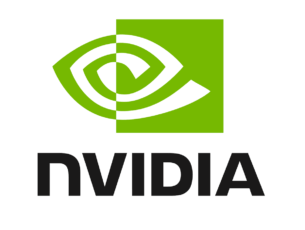 Aveva Everything3D is another software option for pipe designing offering you complete support for migrating from AVEVA PDMS projects reducing cost, timescale and project risks. AVEVA 3D has the ability to shorten project stages, reduce efforts and eliminating errors and rework while offering options for a more efficient collaboration. 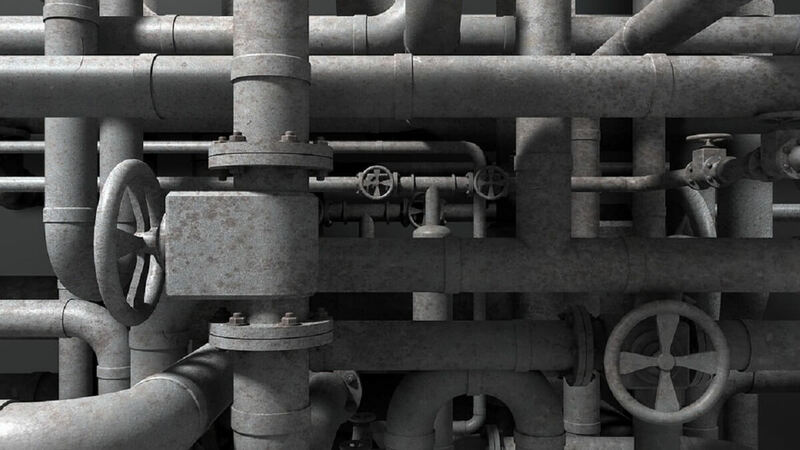 In this article, we listed some of the best options of piping design software offering you a wide range of features to cover all your piping design needs. These options gives you the tools you need to create 2D and 3D models at a professional level. Let us know what you think about these tools in the comment section below.